Hyperloop transport, medical diagnostics, modular satellites - it's all happening at this year's FiRe tech conference in Utah, as Ed Butler discovers. Hyperloop transport, medical diagnostics, modular satellites - it's all happening at this year's FiRe tech conference in Utah. 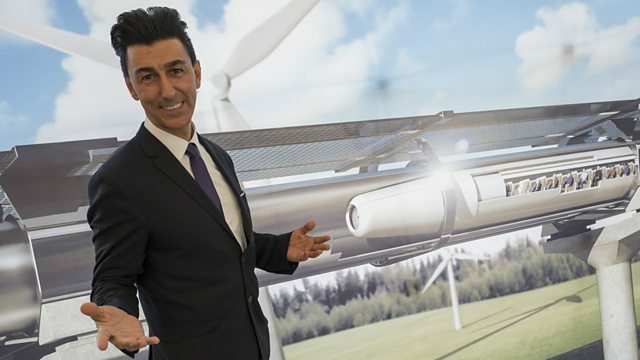 Presenter Ed Butler speaks to Bibop Gresta, chairman of Hyperloop Transportation Technologies, about the company's contracts to build this futuristic near-sonic speed transport system in Slovakia and in another yet-to-be-disclosed country. Caitlin Cameron, head of OtoNexus, explains why their gadget for diagnosing ear infections can help reduce antibiotic overprescription and potentially boost kids' immune systems. Ed also meets Talbot Jaeger, founder of NovaWurks, who wants to further the ambitions of his fellow entrepreneurs with a Lego-like system of "smartphones for space on steroids". Future in Review: The Importance of "Flow"